This scenario was originally released as an add-on for the CMBO GOLD demo in the year 2000. For many players (that includes me) THIS battle was their first CM experienc. Starting in late August the headlong Allied advance suddenly encountered stiff resistance from well-organized and prepared defenses known as the Siegfried Line, or more correctly the West Wall. Hindered by long supply lines, tough terrain, and determined defenders the Allies were back to taking ground meter by meter. This battle portrays a typical assault by American forces against prepared German defenses. It is recommended that the player first try this battle as the Americans. Battles like these tend to have a few surprises in store for the attacker, so if played from the German side first there will be less surprises when playing again as the Americans.If you play as the Germans, carefully plan your line of defense (check LOS!) and do NOT use the inital deployment. Because of the differences between the CMx1 and CMx2 game engines I had to make a few changes to the original OOB (no flamethrower units, no AT bunker and no “tankriders” in CMBN for example), but I believe this won´t spoil the gameplay. My Valley of Trouble version comes with five AI settings for both sides, so you can play it as single-player scenario and I guess it will have a high replay value. This is my second scenario for CMBN. Next one will be “Saving Private Ryan – Ramelle”. If you find flaws or bugs feel free to drop me a PM on the Combat Mission Forum (my username is TCMHQ). 4 Comments on "Valley Of Trouble CMBN"
I have played this about 5 times on iron level and find it impossible to get anywhere. By the time the guns get knocked out by artillery (there are no forward observers), the game is over. The time limit needs serious lengthening. I’d suggest at least an hour…and that panther needs to be reduced to a more easily killed tank like a Mark IV at least. Great scenario! Loved it! Yes, German surrender with 6 minutes remaining – played Elite. The time constraint is a real one, and you have to move – the question is which way to spot the defenses. I did miss the arty spotters that were supposed to be included, and they would have been very helpful to reduce the arty response time. The map is great. I would certainly play another of your scenarios. Germans auto surrendered with 10 minutes left. Targeted artillery with a delayed response at the start except for the 60mm’s. No need for spotters. The 60’s spotted the guns and mortars and took them out with the help of near area fire from the 105’s. As the infantry spotted the German infantry I moved the 105 tanks up, and later Sherman’s, and knocked out their dug in positions. All total the tanks caused 120 infantry casualties, a gun and the Panther. Artillery caused 18 casualties and sent a lot running onlt to become casualties out in the open to their deaths. I don’t think the German pillboxes caused any casualties. As soon as they were spotted, early on, I maneuvered the 105’s and knocked them out. The tanks did the lions share of damage. Lost only 10 men with 6 wounded, Germans 123 KIA 56 wounded and 9 surrendered. 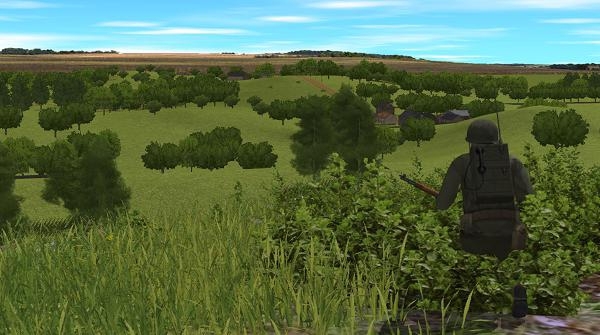 I would recommend adding a German AT gun or two that cannot be seen from the top of the American hill at the start of the game.